They said another weapon only. i think i still got 24+ hrs to send a ticket before it's too late? You may only request upgrade transfer between items of equivalent kind and level. You cannot transfer weapon to headgear or weapon to armor. Campitor has already mentioned the requirement, see below. During this period if you have refined one of these items in order to take advantage of their effects. We will be willing to transfer the refine to the same weapon level/gear slot of your choice. (Example Level 3 weapons can only be transferred to Level 3 or Below Weapons, Upper Headgear to Upper Headgear, etc) Requests must be submitted before the changes take effect. are these changes getting implemented now? I wish the game isn't as broken as I think it is. Please see patch notes here for info on new implementation date. 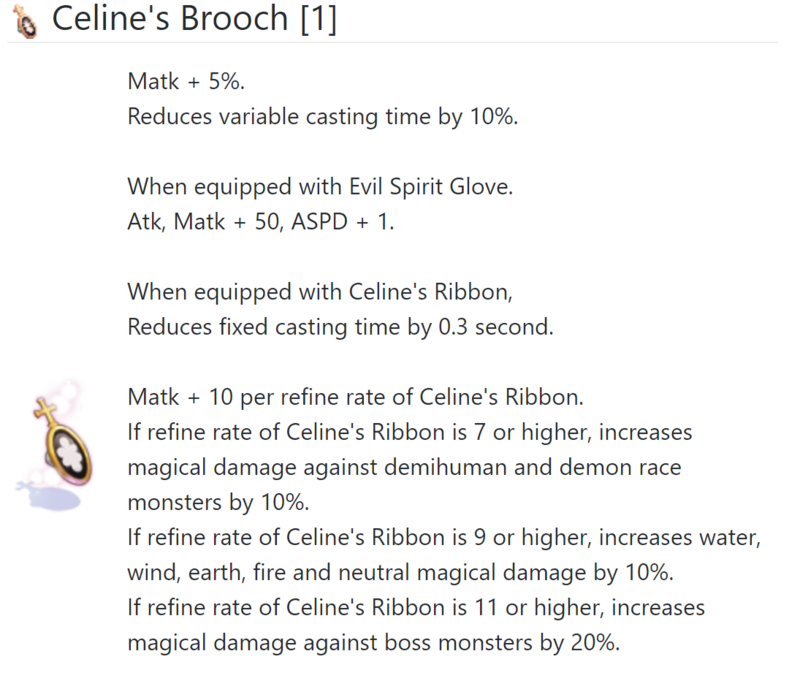 Has Celine brooch been nerfed? Ah ok. I was wondering because I saw it when browsing in divine-pride (the database of iRO) and got by surprise and then I remembered that in this topic was listed Celine brooch to be reviewed and I had to check. divine-pride isnt the iRO database, that's iROwiki, to whatever extent they can. Been advised there should be a way to get a falcon xD thread below Geeze! Edited by ZAccess, 11 October 2018 - 04:35 PM. Considering there is NO100+ level Sniper/Hunter and so to speak there is no Falcon when you changed your job as a Ranger? What does this supposedly for? You can get a Falcon as a Ranger though. Never knew this is possible? Get some flutes or rent directly from the person (Hugel Hunter Guild), you can't have both warg and falcon out at the same time. The ticket system was down for many days. And this is why I can't get my temp ring verified. Wrote a whole ticket, then errored out. Any update on the fix for these items and ETA? Edited by angelopaol1011, 15 October 2018 - 04:06 PM. i have some ocp stuffs given by friend and i see it is on the list. what is wrong on enforcer cape? valk knife? Flee / Reduces damage taken form Neutral property attacks by an additional Flee +1 / +1% per 3 upgrade levels of the item. >>> additional "Flee +3 / 3%" per 3 upgrade levels of the item. >>>add If Cross Impact is at maximum level, Increases the damage of Cross Impact by 5%. >>>add If Soul Destroyer is at maximum level, Increases the damage of Soul Destroyer by 50%. >>>add If upgrade level is +7 or higher, Increases the damage of Soul Destroyer by an additional 1% for 3 base level. Increases the damage of Cross Impact by an additional 1% for 30 base level. This accessory can only be equipped in the right accessory slot. >>>can be equipped in the "left" & right accessory slot. >>>add Kraken Card Set : Mdef +15, Flee +100, Max HP + 15%, Enable Use Stalk Lv1, Enable its user to detect hidden monsters. >>>add Incraces damage more of Knight Skill(Use Giant Lance), Ranger Skill(Use GiganticBow). >>>add Additional ATK & MATK +30 per 3 upgrade levels of the item. Bypass 4% of the hard defense of normal & boss monster and players when perfoming a physical attack per level of Counter Slash known. >>>Bypass "20%" of the hard defense of normal & boss monster and players when perfoming a physical attack per level of Counter Slash known. *New***Increases variable casting time of Meteor Assault . Reduces the variable casting time of Meteor Assault by 7%*15(CS:Lv5,WB:Lv5,WC:Lv5) = 105% . Edited by nayapon, 22 October 2018 - 03:32 AM. The ticket system was down 30 of 31 days. How is that possible for us to submit the ticket. Is that a joke??? Please check the Notes section of how to send a ticket guide here. Work Cap / If Axe Boomerang is level 5, Atk + 100. (i dont see the dmg difference nor it show in alt+q window) ?